It can be tricky but there will always be a time when you need to reverse your caravan. By following a few simple steps you can do it safely and accurately. For those not used to reversing a caravan it is important to note that initially your caravan may provide some resistance and then start backing up with a bit of a jolt. This is a safety mechanism designed to stop the caravan rolling backwards, once its auto-brakes have realised you are reversing it will spring into action. When reversing in a straight line, make sure your outfit is positioned completely straight and that your steering wheel is also in a straight position. You can then proceed to reverse, checking your mirrors at all times. If the van appears larger in one mirror you can correct this by turning the wheel slightly towards that mirror. If you’re new to it, don’t be afraid to straighten up and start again. Reversing a caravan around a corner can be difficult but the key is to position your outfit correctly to begin with. A top tip is to approach the corner from the driver’s side, which improves your visibility of the corner and your outfit. This should enable you to see obstacles and the manoeuvre clearly. You should note that it is often more difficult to reverse smaller vans. With the close proximity of the axle and the towball, the wheels react quicker to steering making it harder to reverse accurately. Twin axle caravans are easier to reverse than single axle vans as the extra set of tyres makes them move slower allowing more time for corrections. Single axle outfits can turn tightly but require quick corrections. It may be an idea to get someone to guide you around the corner. They should stand at a safe distance but with a clear view of the corner. You should ensure you have a confirmed set of instructions or signals so there’s no confusion. We tend to use “left/right hand down”, but check that you both understand the concept before you start. A caravan perfectly parked on a hardstanding pitch. If you are trying to reverse onto your pitch, you would start by driving past it, stopping with the back of your caravan just at the entrance to the pitch. Looking over your shoulder in the direction you want to go, turn the wheel in the opposite direction, as you start reversing slowly. Once the caravan is turning at the correct angle, steer towards the caravan to match the radius of the turn. Decreasing the steering lock will tighten the turn, while increasing steering lock will tend to straighten the outfit. The caravan may move quickly so stay alert to prevent it from jack-knifing. If it doesn’t go how you planned, just start over. Remember always to move the outfit slowly, but be prepared to change the steering wheel position quickly. When reversing it’s important to remember that small movements are the key. You don’t need to turn your steering wheel much to make your outfit go where you want it to. Similarly, moving slowly allows you more time to make adjustments. 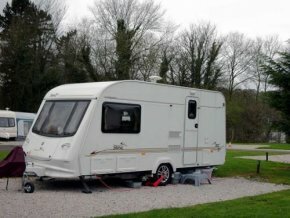 If you’re struggling to get your caravan straight on a pitch you could always detach it and finish moving it by hand, or using a motor mover. Remember not to let your tow car and caravan touch as this could cause costly damage. Reversing a caravan is something that will become natural with practice. Take it steady and follow the tips above and you’ll be comfortable doing it in no time.